Some of the opposition parliamentarians who clashed with police in their efforts to force enter the People’s Majlis have been taken to ADK Hospital with injuries. The People’s Majlis has been padlocked shut by military officers and Special Operations police officers have formed a line around the Majlis premises to prevent anyone from getting in. “Sun”s reporter at the scene confirmed South Thinadhoo MP Abdulla Ahmed and Thoddoo MP Ibrahim Hassan have been taken to ADK Hospital. 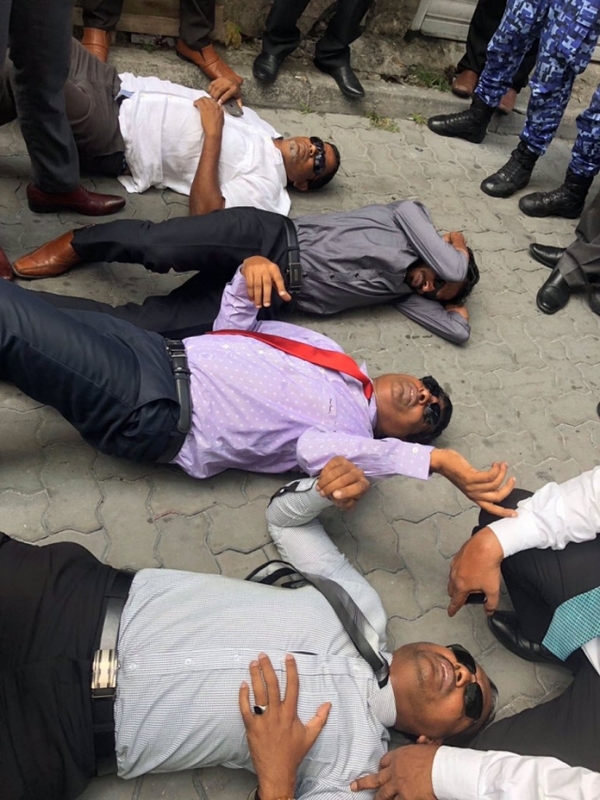 MPs at the scene reported to “Sun” that the two MPs were injured when the police officers guarding the Majlis walked on top of the MPs who fell down during the clashes. The extent of their injuries is unclear at this point. Opposition MPs say they attempted to enter People’s Majlis to meet the Deputy Secretary-General of the Majlis to discuss some issues.